Dr Guillaume Charbonneau, the new President of the College of Family Physicians of Canada, is pictured (left) here along with WONCA North America region president Dr Ruth Wilson (far right), and Drs James and Leslie Rourke (centre). James and Leslie Rourke are the recipients of the WONCA North America Region 5 Star Doctor Award 2017 and Dr Wilson took the opportunity of visiting their province of Newfoundland, to present the award. 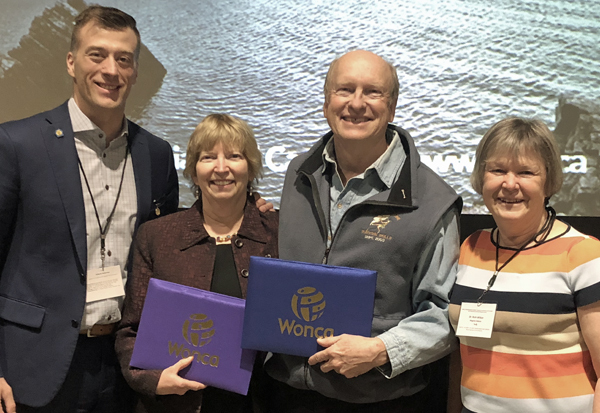 A joint nomination for the WONCA North America 5-Star Doctor may be unconventional, however, in addition to being partners in marriage, 'Jim' and Leslie Rourke have been practice partners throughout their careers, and have also taught alongside one another. Both exemplify the five pillars of the WONCA 5-Star Doctor, through their individual accomplishments and their collaborative work with one another. Dr Charbonneau is a rural family physician from Maniwaki, Quebec. Dr Leslie Rourke is the initiator of the Rourke Baby Record, a widely used evidence-based checklist for tracking the development of children. Dr Jim Rourke is the past Dean of Medicine, Memorial University, Newfoundland, Canada. He is also co-chair of the Rural Road Map Implementation Committee, a joint initiative of the Society of Rural Physicians of Canada and the College of Family Physicians of Canada.